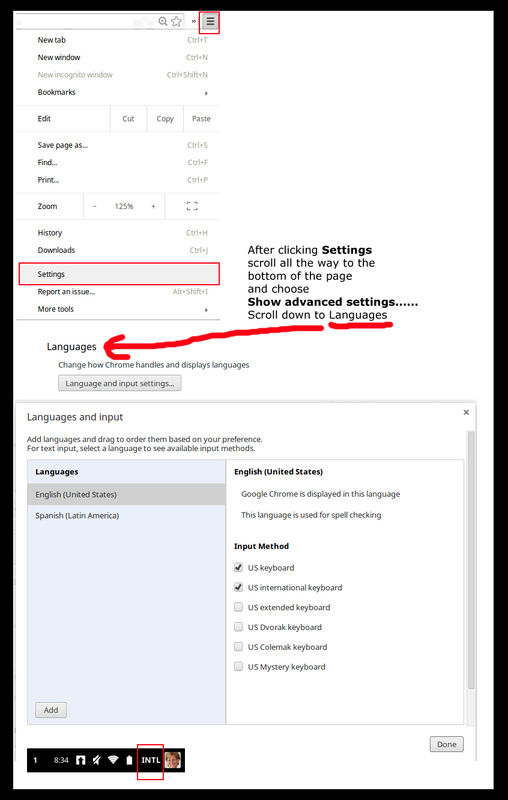 These are the steps to follow to add the International Keyboard to the Chromebook which makes it easy to type accents for the Spanish language. On the right hand side of the ChromeBook go to the three bars on the right and choose Settings. You will see US in the bottom right. Click on US. Now that you see INTL over on the bottom right of your screen you can type your accents. Use the Alt key on the right side of the keyboard. Hold down the Alt key on the right and then click a, e, i, o, u, or n.
This entry was posted in Chromebooks, Web 2.0 and tagged International keyboard. Bookmark the permalink.